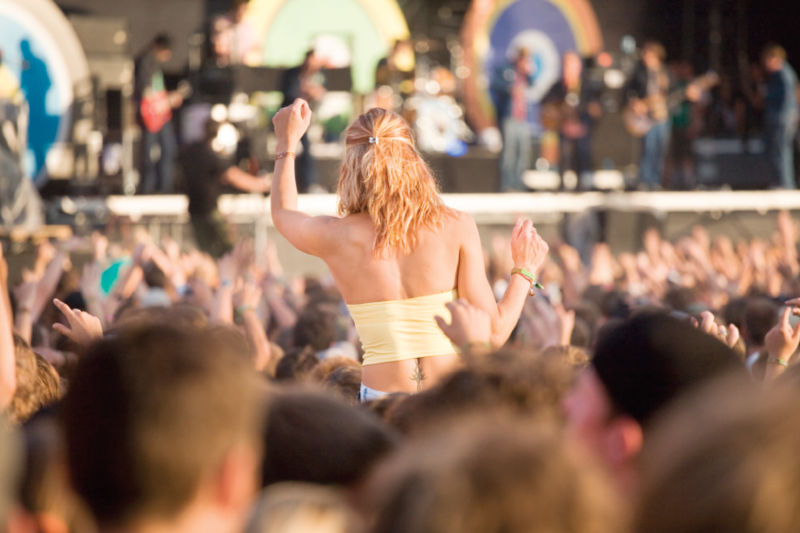 The festival season is upon us, and many festival goers are gearing up for their most anticipated weekend of the year. But the big question many ask is ‘what do I wear’? If you’re looking for a how to in festival style, we’re here to help. Our festival style guide will talk you through outfit ideas, tips and inspiration. Festivals are a fantastic place to let go, enjoy amazing music and just be you. Festival style is a great way to express yourself and push your usual fashion boundaries, but there are plenty of considerations to make aside from how good you look! You’re likely to be on your feet for a lot longer than you’re used to and, especially if you’re going to a UK festival, you might need to prepare for a whole host of possible weather conditions. In order to enjoy a festival to the max you need to dress for comfort as well as style. So what is festival style? It’s relaxed, eclectic and fun. Festival fashion has become a bit of a cliché, so if you really want to get it right check out our festival style ideas and must haves below. When it comes to your festival outfit, it’s best to think in layers. Start with the bare minimum (think HOT) and then plan what you can add as the temperature drops or the rain arrives. Here are some example festival outfits we love. Pair a band or slogan t-shirt with shorts and ankle high wellies. Find a stylish mac to cover-all in the event of bad weather. If you’re sure of good weather, ditch the mac and swap the wellies for some flat sandals. A cute mini dress is always a festival winner. This is a great look to add some stylish ankle boots to finish. Layer with a denim jacket to look cool whilst keeping warm! Short skirts are also spotted in abundance at festivals. If you have a killer figure, you could wear with a crop top to create a serious head turner. If daring to bare isn’t your thing, opt for a fashionable midi skirt and a floaty, boho top. Ankle boots would finish off the look nicely, but wellies can add a fun touch to the mini skirt. You’ve got to remember you’ll be on your feet all day, and outside in all weather and from day to night. You’ll need to carry plenty of supplies, so choose a stylish backpack or easy to carry bag. Select plenty of layers when planning festival style outfits so you can take off or put on as the weather changes. Accessorise with jewellery, glasses and hats to complete the look. And don’t forget something to keep you dry! Even the cutest festival outfit will be ruined by a serious downpour. If you’re looking for festival footwear ideas, you’ve come to the right place! Footwear is the key to all day comfort, so choose suitable festival footwear wisely. 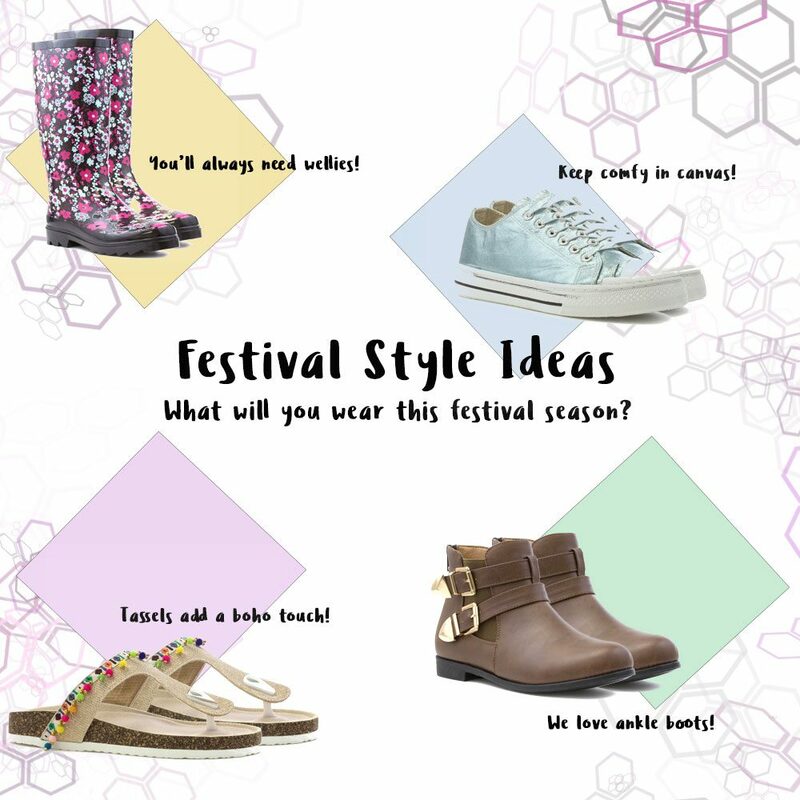 Festival footwear fashion is slightly different to everyday footwear style so take a look at our top picks below. UK festivals usually come with their fair share of mud. There’s nothing better to help you wade through it in style than a pair of wellies! They really are the best festival footwear for all round comfort and that unique festival style. If you’re feeling confident that the weather will hold out or you’re heading to a festival abroad, a pair of flat sandals is a great summer festival footwear choice. Choose a well-fitting pair and your feet will stay both cool and comfortable. Canvas shoes are ideal if you’re looking for protective festival footwear that’s not wellies. You can still tackle plenty of walking and dancing all weekend long in canvas footwear. A pair of canvas shoes offers more protection than sandals but more breathability than wellies, making them a great middle ground when it comes to music festival footwear. Another sturdy but stylish festival footwear option is the ankle boot. They’re a great choice for festival goers who want to be prepared for bad weather but would rather not wear wellies. Opt for flat ankle boots for maximum comfort, or cowboy style boots for maximum style. Already a festival favourite, this year’s crochet pieces have added pizazz with added adornments. There’s a western vibe happening right now, so add a bandana to your outfit if you want an easy upgrade to 2018. There are so many ways to add tassels to your 2018 festival outfit. Clothing, jewellery, shoes or bags could add the right touch. A great choice when it comes to comfort, sportswear is big in the festival world for 2018. Swap the backpack for a belt bag this year to keep things on trend. Once upon a time festivals were all about glitter. This year crystals are a big trend. What you wear on your feet is a big part of festival fashion, so here are our favourite festival footwear trends. 2018 is seeing a comeback of the platform shoe during festival season. Great if you want to add some height to your look. Get the Western look by swapping your wellies for a pair of cowboy boots. They’re this year’s hottest festival footwear. When the weather hots up, grab a pair of fluffy sandals for true 2018 festival style. Whatever you choose to wear, festivals are about having fun and letting go. Opt for the height of festival fashion or simply choose practical and comfortable festival outfits. Either way, make sure you enjoy every moment of your festival this summer!